The fee for hiring the building for the whole day is to more than double to help ease its financial plight. Community and charity groups will now have to pay about £900 to use the building, instead of £425, but commercial ventures will pay even more. Cathedral chief executive Richard Glover said it was the only answer. 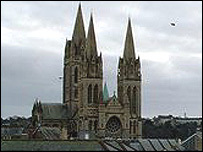 The cathedral reported being more than £160,000 in the red in the last financial year. "The cathedral is in some financial difficulty and I have been brought in to balance the books by next year," said Mr Glover, who began his job last August. "Most people I have met are keen the cathedral stays open. "If we don't balance the books by the end of 2005, it will shut to visitors - the situation is that serious." Mr Glover said he felt the increases were justified. "When I started here, if you wanted to hire the cathedral for a whole day for a concert it cost £425. "I was married at Pendennis Castle in Falmouth last year and it cost £600 plus VAT just for an hour. "It costs more than £900 a day to run Truro Cathedral and I had to bridge the difference between the various figures." Mr Glover said the fee increases would mean fewer events at the cathedral, which would help reduce overheads. He said there would be separate session rates for people who only needed the cathedral for a limited time.